Mt. 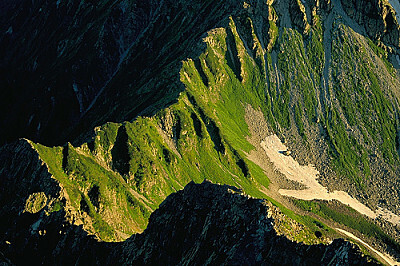 Oku-hotaka-dake or Mt. Yari-ga-take? After having climbed all of Japan's 25 highest mountains, I can honestly say that the Mt. Oku-hotaka-dake (奥穂高岳)/Mt. Yari-ga-take (槍ヶ岳) circuit was by far the most exhilarating AND…… most difficult. Well, for starters, the round-trip course is around 39 km, which is a fairly good workout over a three-day period, even for a person in reasonably good shape. Plus, with the approximate 1700m (~5600 ft) elevation gain from Kamikochi (上高地) to the top of both Mt. Oku-hotaka-dake (奥穂高岳) and Mt. Yari-ga-take (槍ヶ岳), the 300m drop in and out of the Daikiretto (大キレット, Japanese for "Big Cut"), and all the other hundreds of meters of ups and downs along the course, this mountain climbing trip I made Aug. 11-13, 1994 was without question one of the most difficult things I've ever done in my entire life. Mt. Oku-hotaka-dake (奥穂高岳) is not only the tallest mountain in the Northern Japan Alps, but is also one of the 100 Famous Japanese Mountains (日本百名山, Nihon Hyaku-meizan), as is Mt. Yari-ga-take (槍ヶ岳). To facilitate this trip, I had the good fortune of climbing with my 60-year-old English student, Mr. Ohno, an experienced mountain climber who's even scaled Mt. Fuji (富士山) during the winter. Mr. Ohno drove us in his Toyota SUV, which greatly simplified the transport portion of our trip, which is always somewhat of a challenge in accessing Japan's beautiful backcountry. Leaving Tokyo on Wed. Aug. 10, 1994 @ 9 pm, we reached the Sawando (沢渡) parking area around 1:30 am, where we slept in Mr. Ohno's car before catching the 7:00 bus into Kamikochi the next morning. We started our hike on Thurs. Aug. 11 @ 8:30 am from the famous pedestrian suspension bridge known as Kappa-bashi (河童橋), which spans the Azusagawa (梓川, Azusa River), an upper tributary of the 367-km-long Shinano River, the longest river in Japan. Because of the spectacular beauty of the Kamikochi (上高地) area, this bridge is arguably one of the most photographed tourist spots in all of Japan. There are two ways to do the Mt. Oku-hotaka-dake (奥穂高岳)/Mt. Yari-ga-take (槍ヶ岳) loop route, and we chose the clockwise direction (please refer to route map below), heading up the Dakesawa Valley (岳沢) toward Mt. Oku-hotaka-dake (奥穂高岳). The first portion of the trail is quite delightful as it is fairly level and is in a beautiful green forest. But it's not long before it starts getting much steeper, with incredible vistas both up and down the beautiful Dakesawa Valley (岳沢). In fact, between the Dakesawa-goya mountain hut (岳沢小屋) and Mt. Mae-hotaka-dake (前穂高岳, elev. 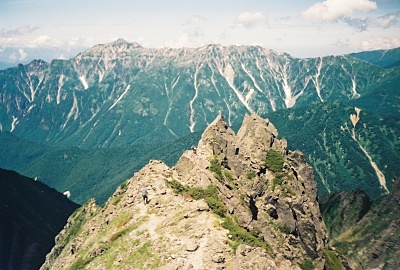 3,090m, Japan's 11th highest peak), you will gain a mind-blowing 900m (~3000 ft) in less than 2 km. Wow! (Please refer to elevation profile graph below.) The Dakesawa-goya (岳沢小屋) is a great place for lunch, by the way. To be honest, Mr. Ohno and I didn't find the summit of Mt. Oku-hotaka-dake (奥穂高岳) that interesting (just a small stone shrine, which according to legend was piled up with rocks high enough to attain its 3190m height, just enough to edge out the 3189m-high Mt. Ai-no-dake, to become Japan's 3rd highest peak), and because it was already starting to get late, we just trudged on toward the Hotaka-dake-sanso mountain hut (穂高岳山荘), our sleeping spot for the end of Day 1, arriving after dark. This hut is part of a network of 44 mountain huts in this area run by the Northern Japan Alps Mountain Hut Friendship Association. A not-so-recent English map of these Northern Japan Alps mountain huts can be found here (Google map in Japanese here (scroll down toward the bottom of the page)), along with a not-so-recent listing of these huts with phone numbers & URLs. The sunrise the next morning from Hotaka-dake-sanso (穂高岳山荘) mountain hut was quite remarkable, with the sun actually rising above a layer of clouds. Several Japanese climbers were doing their usual sunrise ritual, stretching in unison in a style similar to "Radio Taiso Daiichi" (the traditional morning Japanese exercise tune used at schools and companies), but minus the music. And before setting off on our way toward Mt. Karasawa-dake (涸沢岳, elev. 3,110m, Japan's 8th highest peak), we were treated to the sight of a helicopter landing at the hut to replenish supplies. 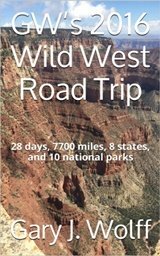 The exhilarating, panoramic views that you get along this ridge hike over to Mt. Kita-hotaka-dake (北穂高岳, elev. 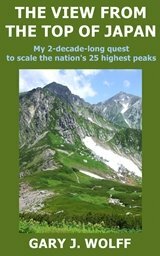 3,106m, Japan's 9th highest peak) and Kita-hotaka-goya mountain hut (北穂高岳小屋) are typical of the magnificence that make the Northern Japan Alps (北アルプス) one of the most spectacular places on the planet. To the west you can see Mt. Kasagatake (笠ヶ岳), Japan's 34th highest mountain; to the east you can look down into the Karasawa Cirque (涸沢岳カール) and then even further east over to Mt. Jonen-dake (常念岳), Japan's 45th highest mountain; and to the north you can see the rest of the mountains along the Hotaka ridge in the direction of Mt. Yari-ga-take (槍ヶ岳). The Kita-hotaka-goya mountain hut (北穂高岳小屋) has a veranda, picnic tables, plenty of food, refreshments, an invigorating view, and so is obviously a great place for lunch. It's also a great place to collect your wits, quiet your nerves, & say a prayer, because not very far from here, things start getting VERY interesting. To be perfectly honest, descending the Daikiretto (大キレット, Japanese for "Big Cut") was the most radical and scary thing I've ever done in Japan. Because of all the conveniently located ropes, chains, and ladders, this trail section can be considered non-technical, but let's be clear. This is not a place for mistakes, or you are liable to meet your maker. 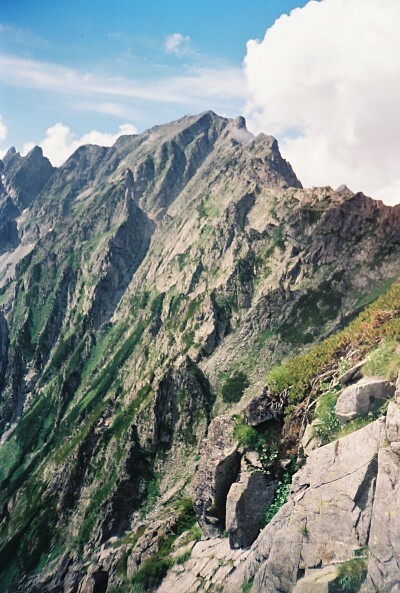 What makes it so dangerous, even in clear weather, is that the 300m drop (~1000 ft) is essentially vertical, and then you have the 300m climb back up on the other side to look forward to. Lovely. 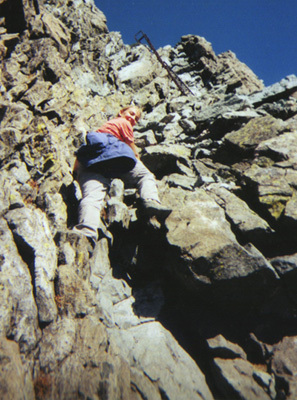 During the past 30 years, over 500 people have lost their lives attempting to scale Mt. Oku-hotaka-dake (奥穂高岳) and Mt. Yari-ga-take (槍ヶ岳). 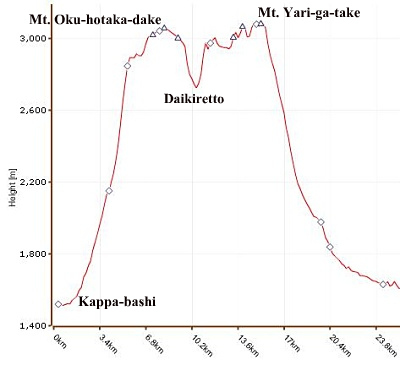 Because of the dangers inherent in dealing with Daikiretto (大キレット), many climbers choose to forego it altogether and scale Mt. Oku-hotaka-dake (奥穂高岳) & Mt. Yari-ga-take (槍ヶ岳) individually as separate 2-day trips. "There isn't so much a trail on the Daikiretto -- there are good ways to go (marked by '0's), bad ways to go (marked by 'X's), and very, very bad ways to go (marked by a skull and crossbones, I'm not kidding -- you get the point). The goal of hiking the Daikiretto is very simple: do not die." On the second night we camped in Mr. Ohno's tent in the campsite next to the Minami-dake-goya mountain hut (南岳小屋). For dinner we had Mr. Ohno's home-cooking, consisting of smoked salmon w/ parsley, mushroom rice, & onion soup. Yum Yum. It was a nice finale to a VERY difficult day of climbing. On Day 3 Mr. Ohno and I arose around 3:30am so we would have enough time for breakfast and to get atop Mt. Minami-dake (南岳, elev. 3032.7m, Japan's 17th highest peak) in time to view the sunrise. And boy was it ever a NICE sunrise, when we were rewarded with stunning views of both Mt. Fuji (富士山) and Mt. Yari-ga-take (槍ヶ岳), our main target for the day. Plus, we knew we would have a very LONG day ahead of us, as we were also planning to hike out that day back to Kamikochi (上高地), catch a bus to the car, and then drive back to Tokyo. On the ridge over to Mt. Yari-ga-take, we passed by the not-so-exciting Mt. Obami (大喰岳, elev. 3,101m) & Mt. Naka (中岳, elev. 3084m), which to be perfectly honest, made such an impression on me, I can't even remember them nor did I bother taking any pics of them. To me, they just seem like little rises on that LONG Hotaka Range ridge, but because they surpass the magical 3000m mark, Mt. Obami & Mt. Naka have earned the status of Three-thousanders (日 本の山一覧 (3000m峰)) and rank as Japan's 10th & 12th highest peaks, respectively. The last 100m or so up to the summit of Mt. Yari-ga-take (槍ヶ岳) from the Yari-ga-take-sanso mountain hut (槍ヶ岳山荘) is quite steep, and will provide a pretty good adrenaline rush for less experienced climbers. This very vertical section of trail gets so congested that they have an “up” route and a “down” route. The 360° panoramic view from the summit of Mt. Yari-ga-take on a clear day is breathtaking. "Yari" means "spear” in Japanese, which is a very appropriate name, considering Mt. Yari-ga-take's pointy shape. Also, Mt. Yari-ga-take (槍ヶ岳) is often referred to as the "Matterhorn of Japan" due to its resemblance to the famous peak in the Swiss Alps. The 22 km back to Kamikochi (上高地) from Mt. Yari-ga-take (槍ヶ岳) was long and arduous (TOO much hiking for one day), in spite of the beauty of the Azusagawa (梓川) mountain stream which the trail follows much of the way. And it didn't help matters that we got totally drenched during the final two hours of our hike with a typhoon-strength downpour. Regrettably, because my old Boy Scout-era poncho didn't cut the mustard, I got soaked to the bone. But as we trudged through this hellacious rainstorm, I started counting my blessings, wondering what we would've done had we been rained on like this while trying to negotiate the Daikiretto (大キレット). OMG! The thumbnails below are a sampling of my 84 pics hosted at Flickr. Clicking on the collage below will open up my Flickr photo page. I hope you enjoy them! Click here to view my Mt. Oku-hotaka-dake (奥穂高岳) & Mt. Yari-ga-take (槍ヶ岳) pics, taken Aug. 11-13, 1994. If you're planning to start hiking from Kamikochi (上高地), please be advised that private cars are prohibited, so hitchhiking is out of the question. That pretty much limits your viable options to bus & taxi. 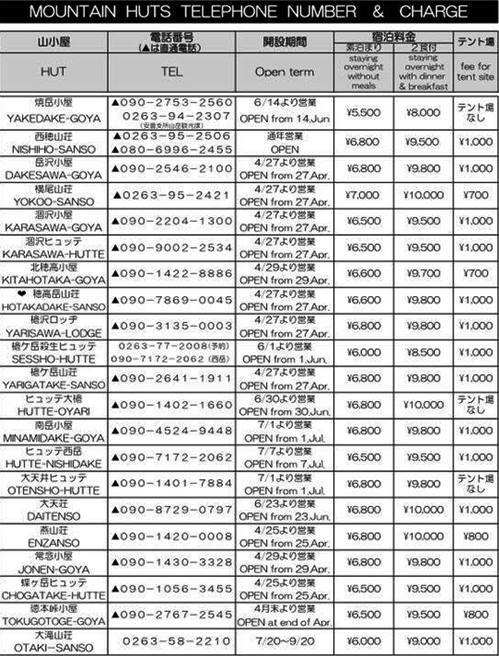 Direct bus service to Kamikochi (上高地) is available from Shinjuku, Yokohama, Osaka, & Kyoto. The Alpico Group overnight highway bus is a convenient way to go, plus saves you a night's lodging. Or you can take the train from Matsumoto and catch a bus from Shin-Shimashima Station, the last stop on the Matsumoto Dentetsu Line, but it's much more pricey this way. Another interesting option is to approach from the west side, taking the ropeway from Shin-Hodaka Onsen (新穂高温泉) up to Nishi-Hodaka-guchi (西穂高口). Although the Shin-Hodaka Onsen (新穂高温泉) elevation of 1117m is ~400m lower than Kamikochi (上高地), you can start hiking at elevation 2156m (some purists would say this is cheating), plus this route shaves ~5 km off the Mt. Oku-hotaka-dake (奥穂高岳)/Mt. Yari-ga-take (槍ヶ岳) loop down to ~34 km. Because the LONG, 22-km Mt. Yari-ga-take (槍ヶ岳) to Kamikochi (上高地) stretch just about killed me, I REALLY like this ropeway idea. An example route map & elevation profile for this western approach to Mt. Oku-hotaka-dake (奥穂高岳) & Mt. Yari-ga-take (槍ヶ岳) can be seen here. Without question, my 3-day climb of these 2 peaks will go down as one of the greatest accomplishments of my lifetime. It was extremely difficult, but the many rewards, including fond memories and being able to share my story over the past quarter-century, have been phenomenal. Another good point is that along this one route alone, you can knock out 8 of Japan's 17 highest mountains. And if you're big on lists as I am, this is a very efficient use of your time, being able to climb 8 of Japan's tallest peaks over the course of just a few days. There's something magical about the Northern Japan Alps (北アルプス). 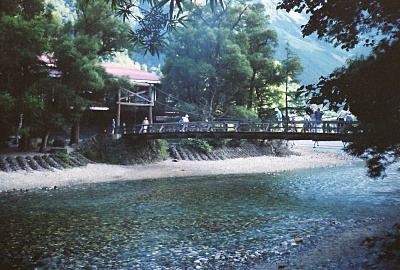 And Kamikochi (上高地), surrounded by several of Japan's highest mountains, is ground zero. I'm always amazed by the number of Japanese people who've never been to (or even heard of) this beautiful area, the birthplace of Japanese alpinism, which was first popularized in Japan by British missionary & climber Rev. Walter Weston in the late nineteenth century. But even if you're not a climber, you owe it to yourself to just go and see it with your own eyes. Thank you very much for visiting this page, and if you by chance have already had the pleasure of climbing any of these peaks, by all means I hope you will take a few minutes to share your story below with future climbers. Please stop by again soon, as I hope to update this page with more details in the future. If you have any questions for me, please give me a shout by clicking on the "Contact Me" link. And if you have plans to climb these peaks, I wish you my most heartfelt good luck!! 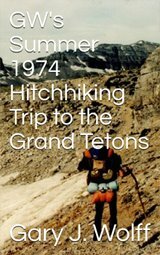 Have a Question or Story about Climbing Mt. 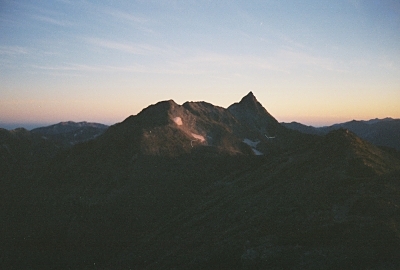 Oku-hotaka-dake or Mt. Yari-ga-take? Do you have a question or story about climbing Mt. Oku-hotaka-dake or Mt. Yari-ga-take? 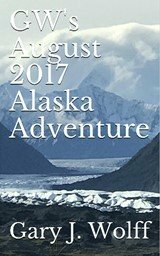 Be among the first to pay it forward and share your climbing experience (along with up to 4 pics) with other visitors to this page still planning their climb! Unlike social media sites like Facebook & Twitter where your post quickly gets pushed down off the page, your story will be given a dedicated webpage and its own URL, giving others a chance to comment. And feel free to link your story back to your webpage, blog, or any other page of your choosing. Your question or story will appear on a Web page the way you enter it here. You can wrap a word in square brackets to make it appear bold. For example [my story] would show as my story on the Web page containing your story. When does the Hotaka-dake-sanso close in 2017? Is eating at the mountain huts an option, rather than carrying all my own food? 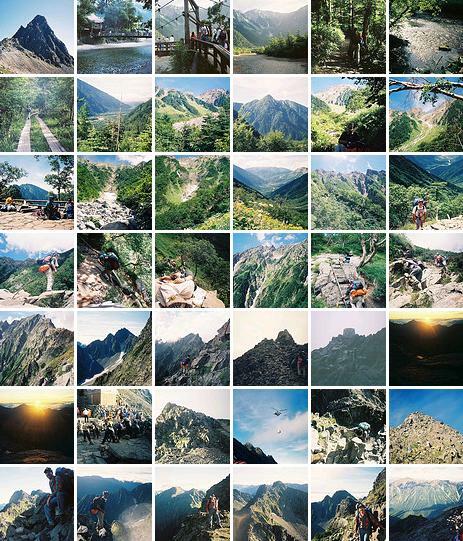 How is the Kamikochi to Oku-hotaka-dake to Yari-ga-take route at the beginning of April 2015? Are sleeping bags necessary in the mountain huts on route to Mt. Oku-hotaka-dake? Is it possible to climb Mt. Yarigatake via Kamikochi in 1 day by doing back trail route? Is the Nishi-hotaka-dake/Oku-hotaka-dake/Kara-sawa/Yokoo-sanso/Yari-ga-take route well marked? Is it feasible to hike from Hotaka-dake-sanso to Yari-dake-sanso in 1 day? Advice appreciated on hike from Kamikochi, thanks a lot! Is a sleeping bag required in Northern Japan Alps mountain huts? 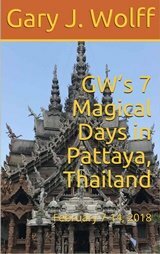 I will be visiting the area with my family from July 8 through July 11.